What goes well with leather furniture? Leather is one of the more durable, low maintenance surfaces for home furnishings. No wonder they’re a popular choice here in Dubai. Furniture stores in Dubai have a wide selection of comfy and stylish leather sofas but just owning a luxury leather sofa alone wouldn’t style the whole place. In fact, too much big and bulky leather upholstery can make a space look dark, heavy or just boring. If you are wondering on how to dress up your room with all those leather sofa Dubai, here are some ideas that would help. Pick a complementing wallpaper for your leather sofa set. Rooms with light coloured walls always look the largest. It creates an inviting an airy ambiance. White is an ideal backdrop because it is so versatile. It creates the perfect backdrop to darker, dramatic furniture colours. If white walls may seem to be too pale for your liking try accenting it with bolder accents. Rich colours also enhance and uplifts dark leather sofas. Bold or patterned walls gives character to any room. If you really want to show off to family and guests opt for a bespoke wallpaper. With the flexibility to choose colours and patterns your walls would surely compliment your leather sofas. Looking for a furniture shop in Dubai that offers quality wallpaper? Boo-Burys furniture offers a wide array of wallpapers and we also do bespoke wallpaper designs too. Large bookcases and cabinetry in the room can also be painted to match the walls. For a subtler effect, paint only the backs of the bookcases or the interiors of the cabinets. Try adding few contrasting coloured pieces to emphasize the wallpaper. Take a Hermes orange wall up a notch by adding peacock blue accents like a pair of footstools or furnish seats with blue cushions. Black, grey and whites. Incorporate textures to keep the space interesting. Build up texture and shine for a classic yet subtle playful feel. Mirrors are a great for this theme. Lighten up a Chesterfield leather sofa by surrounding it with soft warm neutrals like ivory, cream, beige, wheat and gold. Try crisp white walls with a pale natural cowhide rug and light grey velvety pillows. Add a cream coloured throw or for some character toss a Boo-Burys union jack throw on your furniture. Shades of grey, black and white are a fool proof combination for dark and brown leather sofas. Leather also looks stunning alongside rich autumnal fabrics like tweed, velvet and rustic, nubby linen. Be creative and combine leather with tweed not only with using accessories and accents but also in furniture itself. Bespoke furniture is becoming a trend nowadays as consumers are demanding personalized and more creative designs. 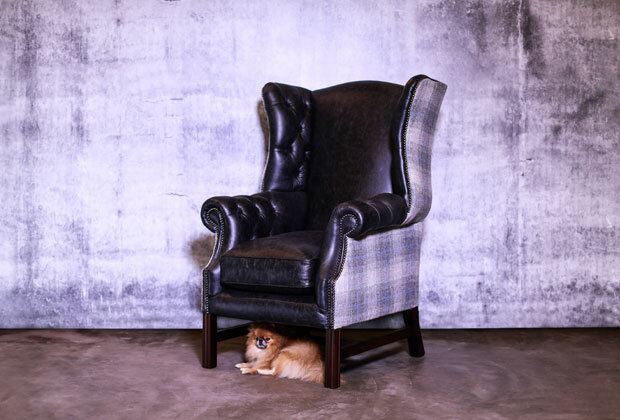 Our shop specializes in bespoke chairs and one of our recent projects is a black leather wing chair with Harris Tweed back upholstery. This chair is truly an epitome of gentlemen’s chair. The great thing about leather furniture in Dubai is that they offer a wide variety of colours. The downside is that it would be difficult to change your leather sofa colour frequently. It is a good thing cushions are a lifesaver when it comes to dressing up leather furniture. Bored of your white leather sofa set in Dubai? Add floral cushions and lush green textured cushions for a dainty and spring feel. Light yellow and cool hues of blue for summer. Pumpkin oranges and rich mustard yellow to depict the changing leaves of autumn. Winter cushions can be warm cinnamon, cranberry or velvety white with addition of metallic gold or silver for the festivities. Black luxury sofa beds also work well with just about any colour cushions. Recreate that showroom living room models found in western furniture Dubai with the help of comfy cushions. Well-lit living rooms emanates an inviting atmosphere. Instead of using boring spot lights use contemporary or vintage lamps to compliment your distressed leather sofa. Marbles and steel also goes well with leather furniture. Create the perfect balance by partnering a rigid steel and marble table with curvy Chesterfield sofa or Chaise Lounge. Sometimes finding the right table to accentuate your leather furniture is tricky. It is about finding the right height and width. For these kinds of problems our shop recommends TAM furniture as they have quality bespoke furniture. With use of traditional materials like marble, wood and steel design a contemporary furniture that would fit your requirements. For more great ideas and suggestions for your space visit our Brilliantly British showroom at The Courtyard Gallery, Al Quoz 1, Dubai, United Arab Emirates.